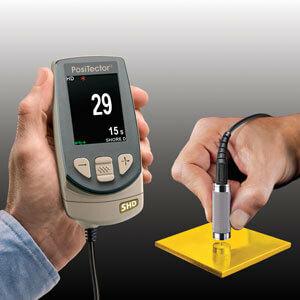 The Positector SHD measures the hardness of non-metallic materials. Features include user adjustable measurement time with on-screen countdown to conform to international standards, internal memory, on-screen statistics and an electronic ‘maximum’ reading indicator. 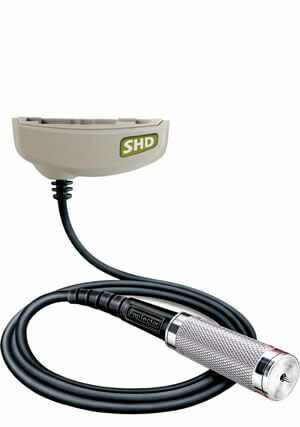 Available in two hardness ranges – Type A and Type D.
Compatible with – Standard Body, Advance Body, Probe only. 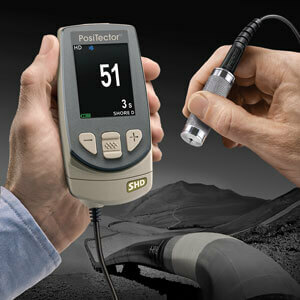 Handheld electronic instrument measures the indentation hardness of non-metallic materials. 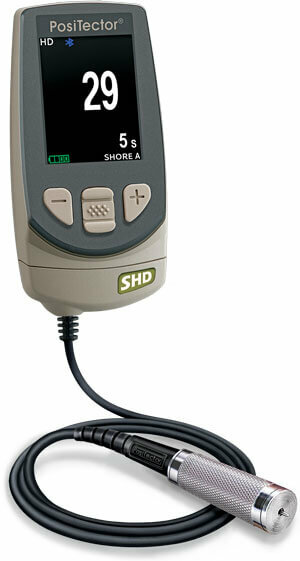 Two durometer models are available for different hardness ranges – Shore A and Shore D.
All gauges come complete with test block, protective rubber holster with belt clip, wrist strap, 3 AAA alkaline batteries, instructions, nylon carrying case with shoulder strap, Long Form Certificate of Calibration traceable to NIST, protective lens shield, USB cable, PosiSoft Software, two (2) year warranty. Includes the features of the standard gauge, with storage of 100,000 readings in up to 100 batches. Includes WiFi, Bluetooth, and more. PosiTector gauge bodies are compatible with the full range of PosiTector 6000, 200, DPM, IRT, SPG, RTR, SST, SHD, BHI and UTG probes. Medium to extra hard materials such as hard rubber, epoxies, hard plastics, PVC, acrylic, etc. Note: Newer probes may not be compatible with older gauge bodies.